Let’s say you want to be healthy- a healthy, paleo type of a person! You clean up your diet, substituting good fats and pastured proteins for your processed carbs and sugary stuff. You start to exercise, and use body weight movements instead of machines and weights, and start walking and sprinting barefoot instead of jogging long, slow distances in heavily cushioned running shoes. If you are doing these things, I guarantee you are now far more fit and healthy than before- congratulations! If you also meditate or pray on a daily basis, and drink a paleo green smoothie as well; why, you are not only healthy, you are (or are becoming) one of the most healthy and fit people on the planet! Congratulations!! Well, NO. Your total lifestyle needs to be in sync; that is, to be a lifestyle that makes sense, a way of living that embodies the real values of a person grounded in the reality of the paleolithic, or at least in the real values of necessary and desirable things, not just trivialities. What brought this to mind it the time of year: tomorrow, I will start my maple sap collecting, and then boiling down into syrup! Each phase of life should be centered around what is truly important, and necessary for life. This week, the snow is almost gone, and though the wet mud is still all to prevalent, it must be braved! For the maple trees are ready- they cannot wait. When it is still below freezing at night, and gets into the high 30’s and 40’s in the daytime; why, that is when the syrup runs. And so, it means I need to run as well, through the mud and back again, drilling small holes into my trees, putting in the spiles, connecting the tubing, and otherwise setting the stage for the sap to run into collection buckets. 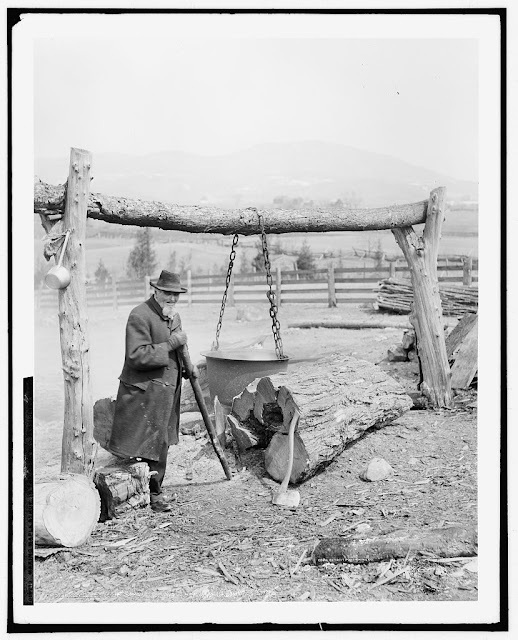 After a bit, I’ll need to start a wood fire, upon which I place a big pot or two of sap, which I keep filled as it boils down, lower and lower as the water vapor boils away, and the sap gradually thickens more and more into the dark, potent brew we call maple syrup. A sweetener, like raw honey, that is far from just a sugar- it is a sweetener with many other compounds within it that benefit our health. For instance- did you realize that maple syrup has an anti-oxidant cocktail of beneficial compounds: it has some that are found in tea, and some that are found in flaxseed? For a sweetener, it is very healthy indeed. For me, maple tapping not only gets me out into the early sunlight of spring (at last! ), and into building a big fire to keep going all day long; it also gets me out into the woods, back in touch with nature! For, although I walk in the woods all winter long, even when ski poles are the only thing that help me to stay upright on the ice, when I’m out in the spring I hear the awakening sounds of nature all about me. Birds, small animals, deer, and even carnivores are stirring all around, reminding me that I am but a part of all of them. Often, I will find myself automatically feeding sticks and logs beneath my fire, while replenishing the sap in the cook pot- but my main attention is on the woods and environment around me. The tending of the roaring fire, and the continual pouring of sap and then replacement of the buckets is automatic. A background activity that keeps me in place in the woods. It makes me a part of nature itself. And for the next few days, probably all week. And I realize now, as I write this, that although it takes up my days at this time of year, that I look forward to it all winter long! The first sign of spring! A moment when I can get outside without being burdened by heavy clothing, when I can smell the vegetation once again in the mud, as the soil reawakens once again with LIFE. When life once again becomes infused with something fecund, something sweet, not just the endless sterility of winter. Just as gardening is rejuvenative later on; maple sapping gives me a jump start! These natural hobbies are as important to me, and my sense of place in the world, as my very health. And, quite honestly: without them- I would have no true health- not at all! I would be cut off from nature, purposeless, like a nursing home resident confined to a bed, or an office worker who only watched TV after work and ate TV dinners. Thank God for the work of tapping trees outside tomorrow!